Bring the family to learn about the value of farming food while being entertained with a lively story, done as only Mortal Coil does, with puppets, stilts, music and actors. The Faerie Play takes place on The Sharing Farm in Richmond, that grows food for the Food Bank, and is a unique, fun, and creative way for young and old to learn about how interconnected we all are. 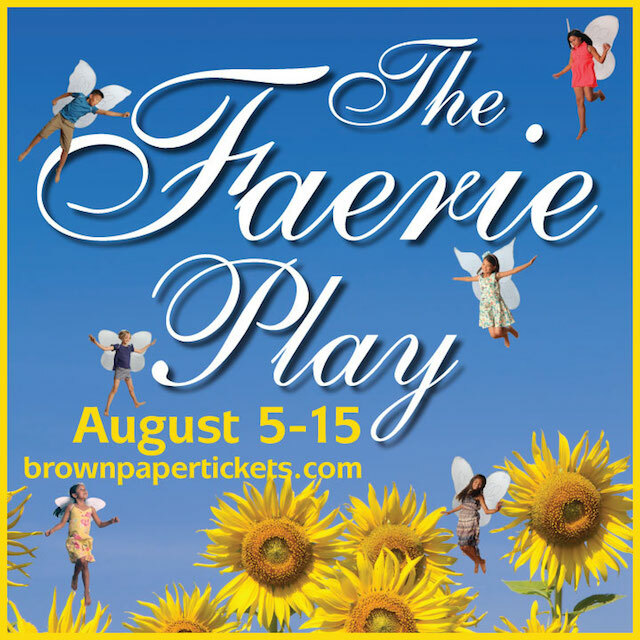 The Faerie Play is a site-specific theatrical production for children and families set on The Sharing Farm in Richmond. This enchanting story is about a child who is part of the local theatre school and is stolen by one of the farm’s resident fairies and must be found by the rest of the cast (and the audience) before she disappears forever into the fairy world. By joining in and following the trail of the fairies and the other residents of the Sharing Farm, the audience will help to solve the mystery. While searching for the lost girl, the audience is guided through the farm learning the secrets of the land. On this journey you will meet raptors, voles, daisies and potatoes that live on The Sharing Farm through Frank Rader and Iona Dan and Joseph Paul’s wonderful puppets as they solve the mystery at the sunflower circle. The play takes place when farm work is actually being done giving the audience an opportunity to interact with the farmers enhancing the understanding of nature and the importance of growing food. Tickets: Purchase online. Adults $15, seniors/students $12, children 6 – 12 $5, children under 6 are free. Please bring comfortable walking shoes. Snacks and light refreshments from the cob oven are available between 3:30 and 6:30, provided by Chef Ian Lai. $3 botanical iced tea, $5 smokey baked beans, $3 toasty corn bread or $10 for all three. Follow Mortal Coil on Twitter and Facebook for more information about this production and others. I will draw one winner at random from all entries at 12:00pm on Monday, August 3, 2015. Update The winner is Trudy! We LOVE corn! So many ways of prepping it… Slathered with pesto, chipotle, jerk sauce or plain ole butter. Yum!